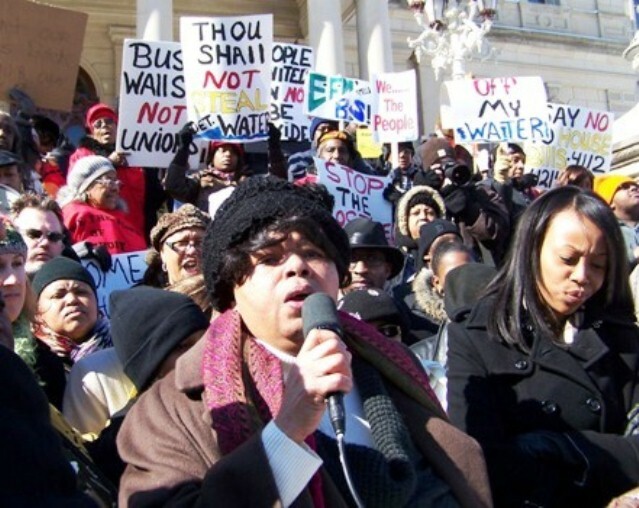 Sandra Hines speaks at rally in Lansing Feb. 23, 2011 which drew thousands of Detroiters out to protest state takeover moves that led to Public Act 4. Ask people to storm Council meetings Tues. Nov. 20, 9:30 a.m. & 7 p.m.
Council Pro-Tem Gary Brown and President Charles Pugh during meeting April 3, 2012, a day before they voted to approve the city’s disastrous PA 4 consent agreement. 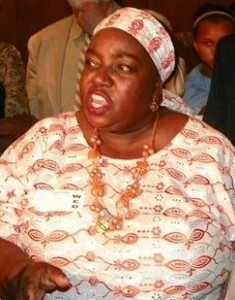 DETROIT – Detroit City Council Pres. 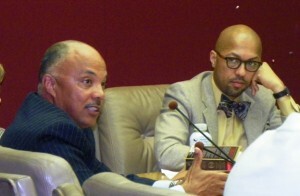 Charles Pugh and Pres. Pro-tem Gary Brown have asked U.S. District Court Judge Sean Cox to completely separate the Detroit Water and Sewerage Department from city control, in order to effectuate the $48 million EMA Group plan to cut 81 percent of the department’s workforce. The two were among five signers of a “Root Cause Committee” report Nov. 8 which asked Cox to thereby circumvent the Council’s power over the contract. DWSD asked him to approve the committee’s recommendation Nov. 15, but he has not yet taken action. The U.S. Environmental Protection Agency (EPA) initiated the 1977 consent agreement under which a federal judge oversees DWSD Clean Water Act (CWA) compliance. It requested Oct. 16 that Cox delay any action on the EMA contract for 45 days. It said DWSD has been in federal compliance with the Act since November of last year. At Brown’s Public Health and Safety Committee meeting Nov. 19, Detroiters including Councilwoman JoAnn Watson rose up in outrage. They called on people to storm the full Council meeting Nov. 20 at 9:30 a.m., where Brown said he wants the Council to vote the contract “up or down.” Watson said no vote should be held before the Council’s community public meeting that evening, from 7 p.m. to 8:30 p.m. at Mark Twain Elementary School. DWSD workers conducted a five-day strike at the Wastewater Treatment Plant beginning Sept. 30, with the EMA contract a major issue of the strike. Wastewater Treatment Plant rank-and-file workers led a five-day strike beginning Sept. 30, 2012 against EMA contract and other union-busting measures. Despite that hearing and the strike, which had sympathetic news coverage nationally, the Board of Water Commissioners approved a $1,977,000 partial contract with EMA Nov. 13, ducking just under the threshold of $2 million needed for Council approval. 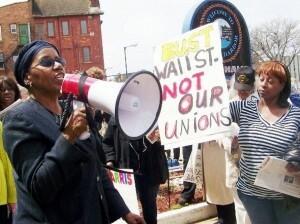 Cecily McClellan leads chants against PA 4 during first protest against EM’s in Benton Harbor. Under the City Charter, and as confirmed by voters who approved Detroit Proposal C Nov. 6, Corporation Counsel Krystal Crittendon can bring legal action against city officials and others who violate the city’s Home Rule Charter. McClellan, who is also Vice-President of the Association of Professional and Technical Employees (APTE), told VOD earlier that no EMA “due diligence” documents were presented at a special meeting DWSD held with Council staff and union leaders in October. 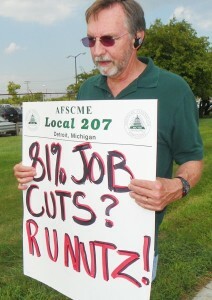 AFSCME Local 207 VP Mike Mulholland protests EMA contract outside DWSD Huber facility in August, 2012. 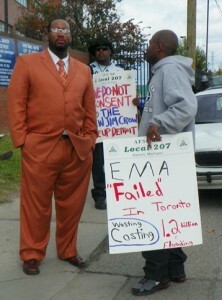 Strikers at Wastewater Treatment Plant raise EMA’s dramatic failure in Toronto. Speakers at the hearing wore vivid “NO EMA” and “NO MILESTONES” ribbons during the meeting. Atty. Michael McGee represented Mayor Dave Bing in opposing Corporation Counsel Krystal Crittendon’s lawsuit against consent agreement July 13, 2012. Miller Canfield’s attorney Michael McGee was a co-author of the “dictator law” Public Act 4, which was struck down by Michigan voters Nov. 6. Ernst & Young first claimed the city was running out of cash in a secret meeting with Council last November. 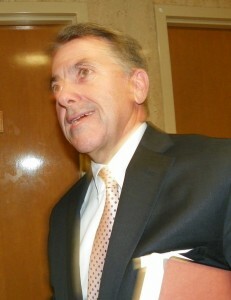 Their financial report later showed the city paid $597 million on its $16.9 billion debt to the banks in 2011-12. Milliman has drafted a plan to takeover and gut the city’s $6 billion pension system. Cox established the “Root Cause Committee” in Feb. 2011, ostensibly to analyze the department’s non-compliance with Clean Water Act and state Department of Environmental Quality department standards. Cox implemented their recommendations Nov. 4, 2011, partially separating DWSD from the city and implementing drastic anti-union measures. (Click on Sean-Cox-DWSD-order-11-4-11). DWSD unions are still waiting for a decision from the Sixth Circuit Court of Appeals on their appeal of Cox’s order, in wake of a hearing held in Cincinnati Oct. 9. DWSD Director Sue McCormick (l) and BOWC Chair James Fausone at BOWC meeting where EMA contract was approved. 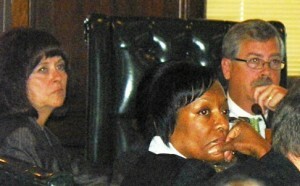 Along with Pugh and Brown, other members of the committee who signed the document were DWSD Director Sue McCormick, appointed to head the department at the beginning of 2012, Walter Fausone, chair of the Board of Water Commissioners (BOWC), and Mayor Dave Bing’s Chief Operating Officer Chris Brown. Channel 7 Action News said Nov. 9 that they had confirmed that Chris Brown had resigned as COO for undisclosed reasons. VOD filed federal complaints in August against Brown, Bing, and former D-DOT Deputy Director Bill Nojay for Hatch Act violations related to Nojay’s run for state office in New York. The case is open and ongoing according to the federal Office of the Special Counsel. The committee reports to Cox’s Special Master David Ottenwess, an attorney who has specialized in defending health institutions from medical malpractice lawsuits. Although the DWSD services this region, it is owned by Detroit. In other areas of this country and region, municipalities and counties have built their own water systems when disagreements or laws were discovered that prevent services and peace with/ to outside users. Instead of strong arming the City, the out counties should collaborate and build their own water system. Had they opted to do that 40+ years ago, instead of trying to takeover Detroit’s, it would probably be completed by now. I think that your article to all of the suscribers to VOD asking them to “Storm to full council meeting” is an incorrect message to send to Detroit citizens. The council meeting is just that, a public meeting where each side should be allowed the time to present their views on the contract change. The water system is a regional system with other counties, and governments being stakeholders in this system. They should also be allowed to have equal time to state their opinions of the water system contract. 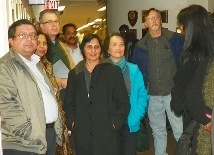 A public city council meeting is not a battleground, it is a community forum. Requesting that citizens “storm” the meeting makes it appear as if you are attempting to have so many persons opposing this transfer, and monopolizing the public comments. there will not to allow time for other views to be presented at this meeting. The article does not ask that Detroiters storm the meeting. 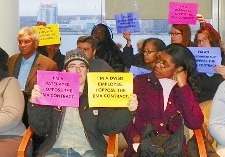 Detroiters at the meeting Nov. 19 asked for that action. The subtitle refers to their comments, not VOD’s.